If you are planning for a trip to Halong Bay, you should choose Ginger Junk as a cruise which can bring you to explore Halong Bay in particularly impressive and attractive route with highlight destinations such as Tien Ong Cave, Cua Van Village and Viet Hai Village on Cat Ba Island. 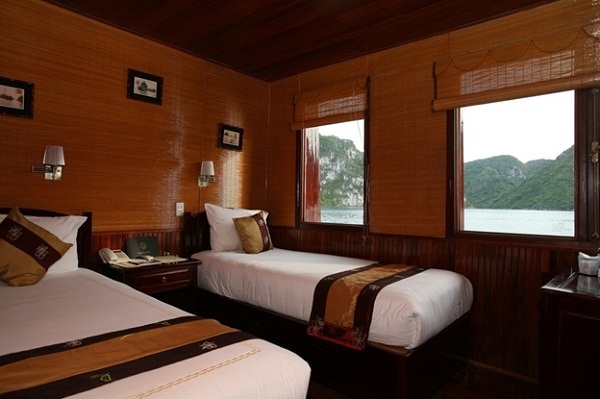 Launched in mid 2006, Ginger Junk Halong Bay is wooden junk that combines between classic beauty of Eastern architecture and Western modern architecture. 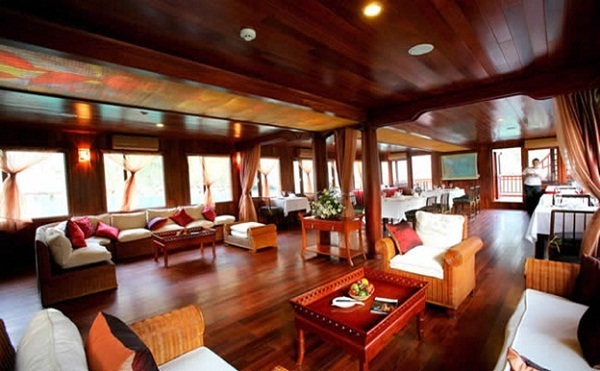 The junk features three decks that house an elegant restaurant, lounge, two bars, a small boutique, library and ten luxurious sleeping cabins. With so much space, passengers can truly unwind and enjoy the bay’s magnificent scenery. Besides, on Ginger Junk, guests are also welcome to make use of binoculars, snorkeling equipment, and top-of-the-line Canadian made Seaward kayaks. The bay its self is like entering a alternate planet lost in time. While the view is undoubtedly the best feature of each of Ginger Junk’s ten guest cabins, guests will also appreciate the rooms’ tasteful décor and furnishings. 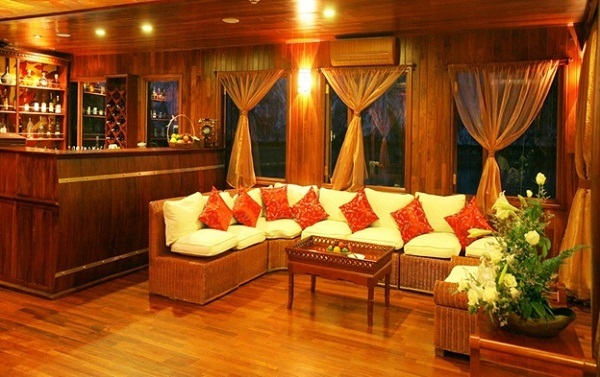 To complement the bay’s natural beauty, Ginger has outfitted the cabins in natural materials: wood floors covered with sedge mats; walls covered with woven bamboo panels; and ceilings decorated with bamboo panels hand-painted with a ginger motif. The standing shower, meanwhile, features mosaic tiles in Ginger flower patterns. 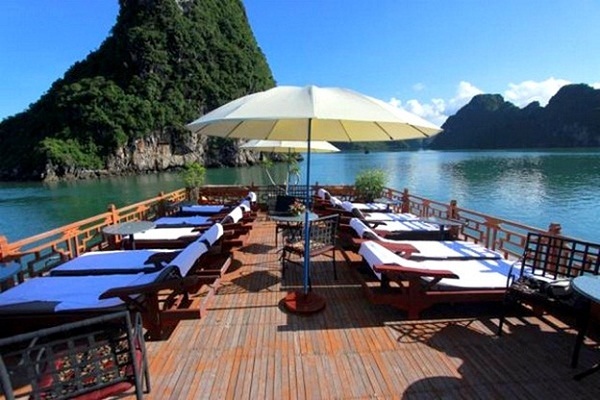 Another wonderful thing in Ginger cruise is the exotic delights of Vietnamese cuisine. Guests can look forward to lavish international breakfast buffets, casual, sit-down lunches of Vietnamese dishes, and formal dinners with delectable fusion cuisine. All dishes are prepared to please both the eye and the palate. Special BBQ dinners are served on the Sundeck of Ginger Junk on weekends, or upon a group’s request. With yellow sails, interior decorated absolutely by wooden, harmony with nature and style of Southeast Asia, Ginger Junk gives tourists exploring Halong particularly impressive and attractive .The bay people are happy to welcome you into their world and proud to show off their homes & families. The evening dinner in the cave was spectacular with a unique setting and top quality food. 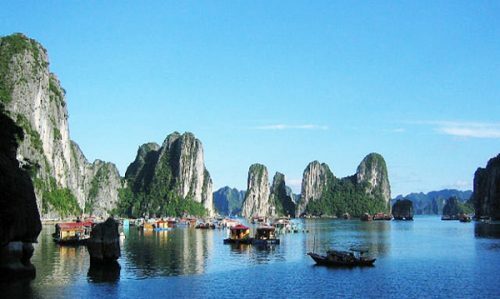 The floating islands and deep green waters will surely make your trip to the bay unforgettable.